Spanning two countries an area of over 400,000 square miles, the fabled land of “Patagonia” encompasses everything from desert and pampas to coastline and towering mountain ranges. 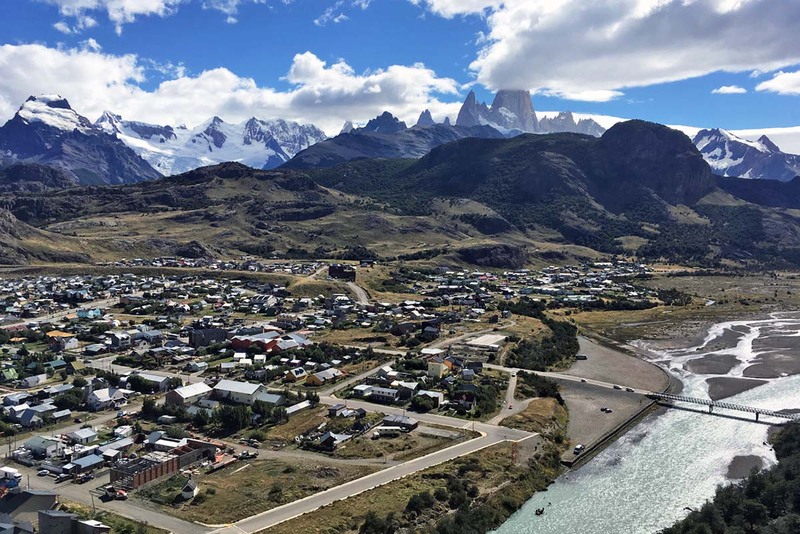 And the tiny town of El Chaltén in Los Glaciares National Park provides a perfect sampler for everyone from beginning day hikers to seasoned backpackers. 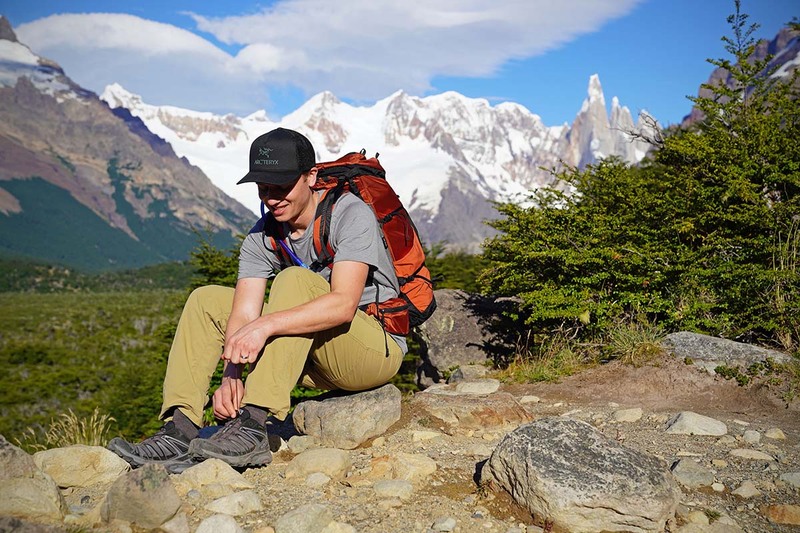 This is the trekking capital of Patagonia, where setting off to the mountains is as easy as grabbing a couple of empanadas from the panadaría next door and hopping from the sidewalk to the trail. 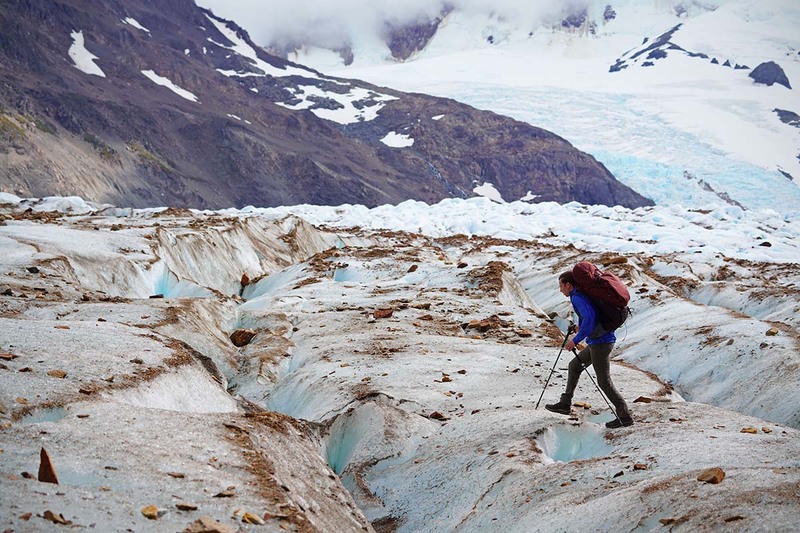 Below we provide details on our favorite treks around El Chaltén including short day hikes, full-day hikes, and a challenging multi-day trek. For more background on visiting the area, see our El Chaltén hiking logistics. 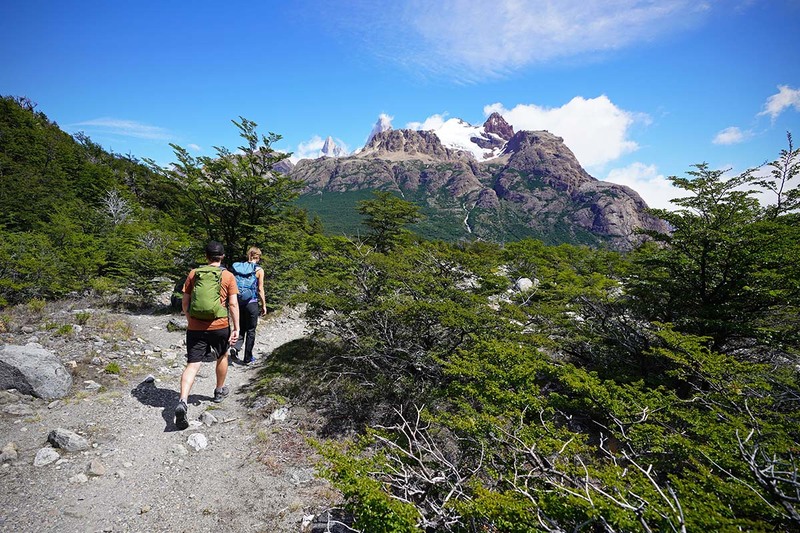 The hike to Mirador Los Cóndores is ideal for families, new hikers, or for those simply wanting to catch the sunrise or sunset with a jaw-dropping backdrop of the Chaltén range. Follow the path that leaves from the ranger station, taking a left at the junction less than a quarter mile from the trailhead. Here, the short trail rises steeply above town, offering stunning, 360-degree views of the Adela, Fitz Roy, and Torre massifs, and the Río de las Vueltas valley. Stop at Mirador Los Cóndores, or continue less than a mile to Mirador Las Águilas for views of Lago Viedma. This large waterfall is an easy walk from town and a great hike to sneak in if you have limited time in El Chaltén or are looking for a mellow alternative to the more arduous treks in the area. Start at the trailhead on the north end of town and follow the path on the hillside, paralleling Ruta 41. The trail will descend to meet with the gravel road for awhile before it arrives at the Chorrillo de Salto trailhead (alternatively, if you have a car, you can start from the Chorrillo del Salto trailhead, cutting over 2 miles off the length of your hike). From here, less than a mile of easy hiking will bring you to the waterfall. Leaving from the trailhead at the north end of town, ascend a steep slope to arrive in an open valley with views of the Fitz Roy Massif. Here, the trail weaves through a forest of ñire and lenga trees, arriving at Laguna Capri in less than two hours. Multiple beaches provide opportunities for lounging with a view of the Fitz Roy Massif on the horizon. On a hot day, you might even be tempted to take a dip. Camping sites and an outhouse also are available on the shores of the lake. It’s a tough choice, but if you only have one day to hike in El Chaltén, Laguna de los Tres probably should be at the top of your list. Be sure to choose a day with clear skies and low winds, however, as this trail ascends a high and exposed slope to the base of Cerro Fitz Roy (and it’s best to start early). Leave from the trailhead at the north end of Avenida San Martín, ascending quickly into a forest with views of Río de los Vueltas to your right (the same trail as for Laguna Capri). After about two miles, a sign will show two options—head left to hike beside Laguna Capri, or right to ascend a trail for Mirador Fitz Roy. Both options are similar distances and converge in a few more miles, just before Campo Poincenot. Continue through both Campo Poincenot and Campo Río Blanco to the base of a scree slope. Here begins the crux of the hike: ascend this very steep and challenging hillside for over 1,200 feet to Laguna de los Tres. Once at the lake, take a deep breath, put on some layers, and enjoy up close views of Fitz Roy, Glaciar de los Tres, and the stunningly blue waters. You can walk along the lakeshore or head to the left about half a mile for spectacular panoramic views over Lago Sucia in the adjacent valley. 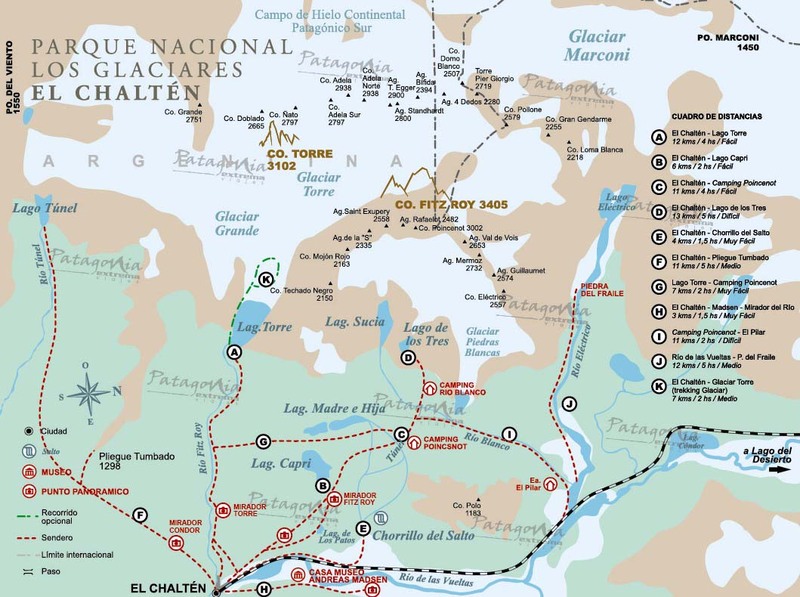 We describe the route from El Chaltén, but alternatively, Laguna de los Tres can be reached by starting at Hostería El Pilar (off Ruta 41), converging at Campo Poincenot with the trail described above. This option cuts off a bit of elevation and a few miles of hiking, and offers stunning views of Glacier Piedras Blancas. Perhaps the best option is to take a taxi to El Pilar, hike to Laguna de los Tres, and continue back to the trailhead in El Chaltén via the route described above. 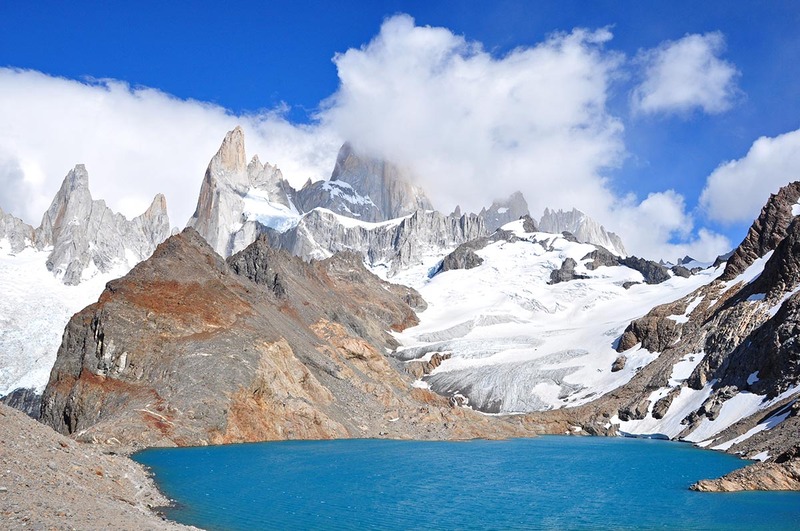 The most popular hike in El Chaltén, the trail to Laguna Torre meanders alongside Río Fitz Roy, offering incredible, all-day views of the Torre Massif. This is the perfect pairing to Laguna de los Tres, allowing you to capture views of the adjacent river valley and granite spires that so often remain hidden behind the towering Cerro Fitz Roy. Leave from the trailhead on the hill above town, ascending steeply at first and then navigating gently up and down on a well-worn trail. 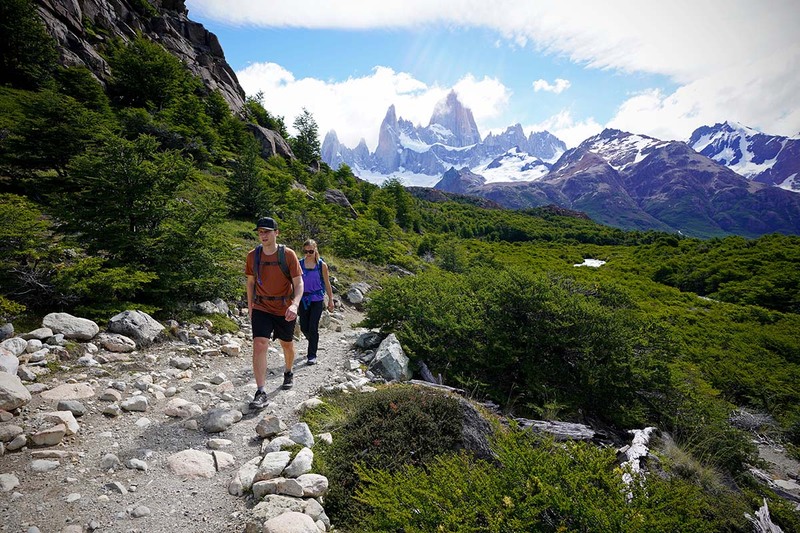 Enjoy your first view of the Torre Valley after just an hour of hiking, then continue down through lenga forests and beside the raging Río Fitz Roy. The trail remains rather flat throughout this section, until the last mile brings you up to Campo de Agostini and the shores of Laguna Torre. Here you’ll find up-close views of the Torre Massif, icebergs floating in the glacial lake, and perhaps even climbers crossing a Tyrolean traverse on the way to the Torre Valley. 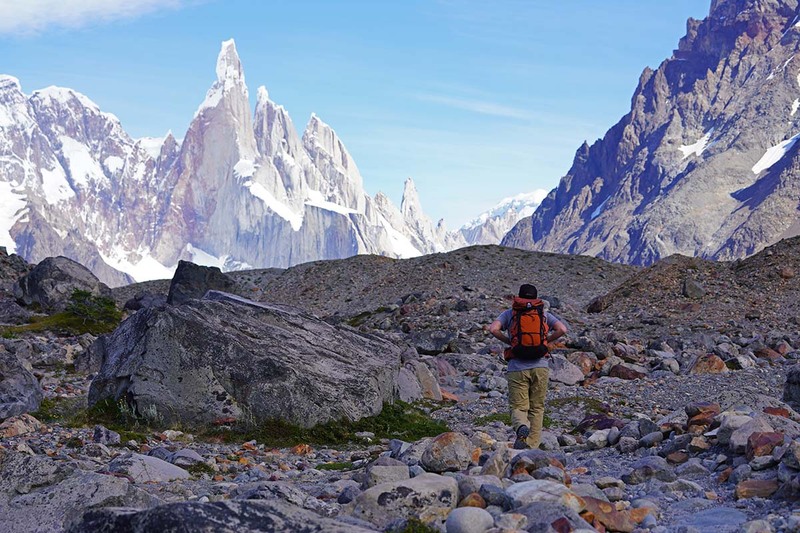 For quiet trails, views of the north side of Agjuas Guillaumet, Mermoz and Cerro Fitz Roy, and a lively refugio serving food and drinks, the hike to Piedra Del Fraile will not disappoint. A flat 4 miles winds beside Río Eléctrico and through enchanted lenga forests to reach the refugio and campground at Piedra Del Fraile. Stop here for fresh bread or a glass of Malbec, or continue on one of many trail options. The most intrepid can head steeply up the hill to the left, ascending a rugged trail to Piedra Negra, a popular basecamp for climbers hoping to summit one of the area’s many granite peaks (to glimpse El Chaltén from a climber's perspective, see our article On Location: El Chaltén). Alternatively, continue up the valley to a wide river basin and the wild Lago Eléctrico, with the option of a detour up Río Pollone to Glaciar Pollone. The trail to Loma del Pliegue Tumbado is lesser-known than the more popular options above but just as spectacular—it’s a perfect way to escape crowds and enjoy slightly different terrain and views. Leave from the ranger station just south of El Chaltén, taking a right at the first junction towards Laguna Toro. You’ll travel through an open hillside above town, rising gently through forests to a pasture with grazing cows. Here, take a right at the intersection (left to Laguna Toro) and continue gently uphill through a tranquil forest with occasional views of the Chaltén range to your right. After a few more miles, you’ll exit the trees and enter a large open meadow with breathtaking views of the entire Chaltén range. It’s tempting to stop here, but continue up to the windy summit of Loma del Pliegue Tumbado to see views of the Río Túnel Valley as well. Getting to Lago del Desierto takes a bit more effort than most hikes in the El Chaltén area—a 23-mile, hour-long shuttle ride down a gravel road, to be exact—but the unique views and fascinating history of the area is worth the effort. The lake is bordered by both Argentina and Chile and provides a jumping off point for many trekkers wishing to hike across the international border. 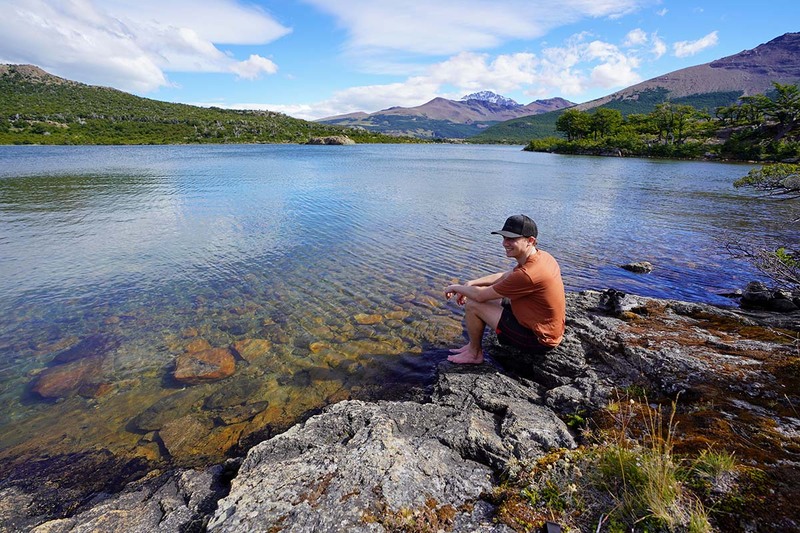 Numerous guiding companies in Chaltén offer varying levels of day trips to Lago del Desierto, from those with fully-catered meals and a boat ride across the lake, to a simple shuttle and guided hike. Alternatively, you can hire a private taxi and schedule a return trip to town in the evening. 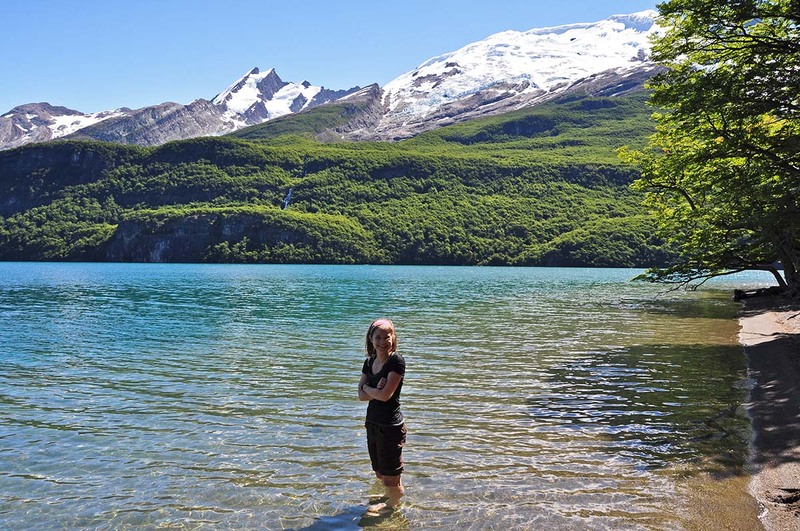 There are many hiking options at Lago del Desierto, including a flat trail that hugs the shore of the lake, and a steep ascent up to Glaciar Huemul. 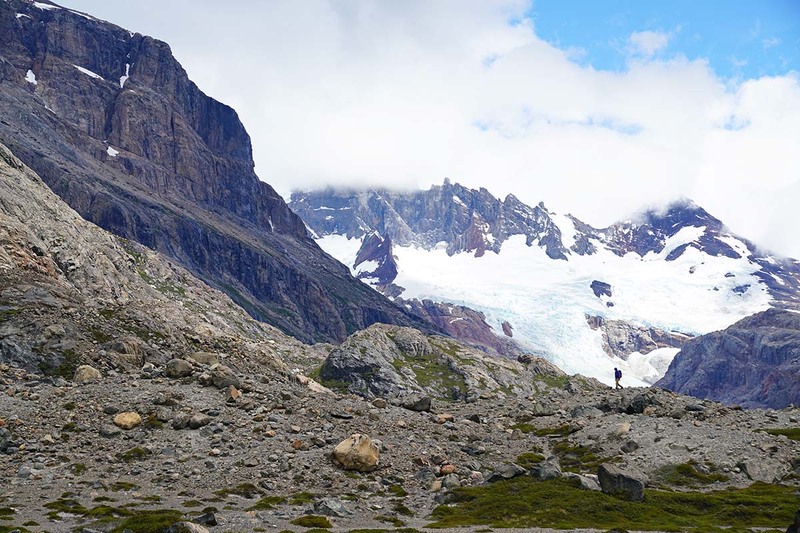 The Huemul Circuit is a challenging, four-day hike that has it all: meadows and forests, rivers and Tyrolean traverses, rocky moraines, iceberg-laden bays, and windy passes. But the unmistakable highlight of the circuit is the unparalleled views of the Southern Patagonian Ice Field, the largest non-polar ice mass in the world. This hike is a serious undertaking and only to be attempted by experienced backpackers. You’ll need to obtain a permit from the visitor’s center, show that you have all the required gear for the Tyrolean traverses, and make sure that the weather is suitable for ascending high and exposed mountain passes. For more details, we are publishing a comprehensive guide to the Huemul Circuit shortly. Of all the places we've visited, Patagonia certainly is one of the most challenging in terms of finding reliable maps. For our trip we used this trekking and mountaineering map of the area, which is quite detailed (albeit a bit large for unfolding on the trail). You also can ask for maps at the ranger station at the entrance to town and in local gear shops. 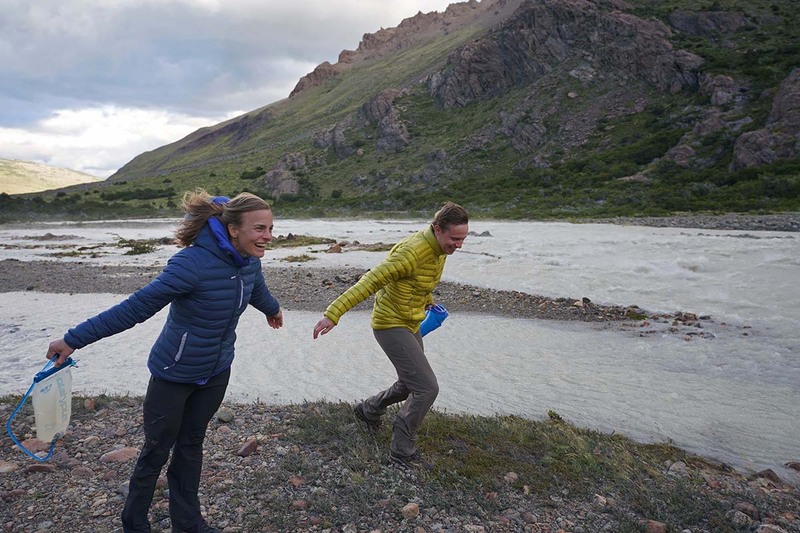 During our hike of the Huemul Circuit, many parties carried GPS of varying types. Below is a simple online map showing many of the day hikes listed above. December – February: This is the peak summer season in El Chaltén, when warm temperatures and long days beckon travelers from all over the world. Crowds are common, making it wise to book accommodations in advance. Temperatures usually hover in the 60s-70s, with nightly lows in the mid-40s. Expect a small amount of precipitation, but much less than during fall or winter. Interestingly, summer also is when the winds are strongest, with gusts commonly reaching up to 75 mph in town. March – April: Argentines and Chilean children go back to school at the end of February, signaling the official end to the summer season. This can be a wonderful time to visit and experience El Chaltén’s calmer side, and you’re likely to find empty trails and deals on accommodations and more. Days will be shorter, temperatures a bit colder, and precipitation more likely. 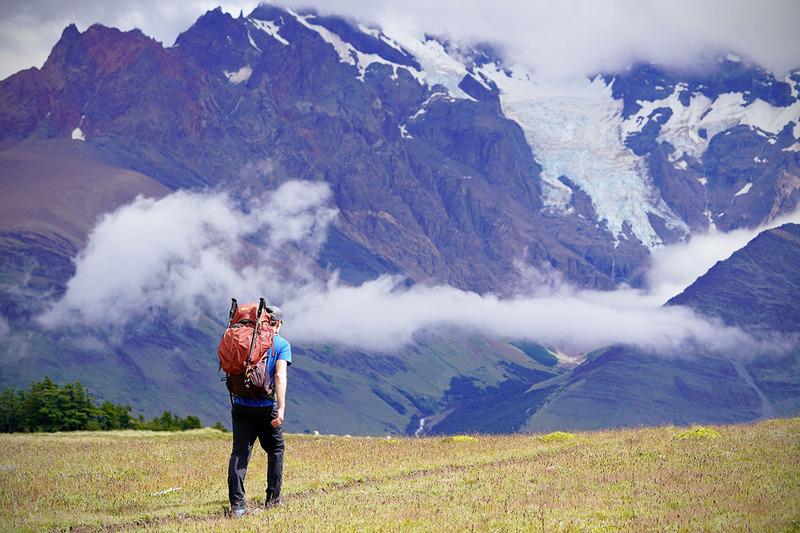 But Patagonian winds calm during the fall, making this a wonderful time for hardy hikers to explore the area. 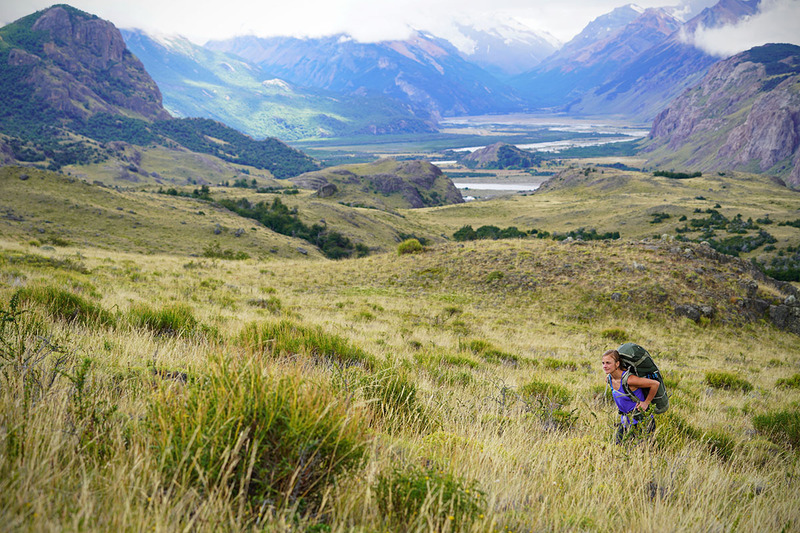 September – November: Spring in Patagonia can be a lovely season for trekking. El Chaltén will be rising out of its winter hibernation, still sleepy but energetic in preparation for the upcoming summer. Temperatures hover in the 50s, and strong wind and rain are less likely than during the summer months. After especially high snow years, snow might still be thawing on the trails, but most routes are possible. The distant mountains will still be covered in winter snow, making for a striking backdrop to your hikes. Patagonia has a reputation for brutal weather, which is 100 percent valid. Even during the peak summer season, strong winds batter the town and angry clouds obscure views of the mountains more days than not. But as we mention above, rain isn’t common during Chaltén’s austral summer, so most days will be acceptable for hiking if you’re willing to battle the wind. We recommend always packing extra layers, and make sure to go prepared with a high-quality rain jacket or hardshell. Weather forecasting for the area has become quite reliable within the past decade, and you can check websites such as Meteoblue or Windguru before heading out. Most of the trails outside of El Chaltén are in great shape. For the most part, they’re flat, wide, and can be traveled in a pair of lightweight hiking shoes or even trail runners. We recommend you bring a daypack with a few liters of water (or a water filter for the many streams or lakes along the way), snacks (we can’t say enough about the empanadas from Tierra de Nadie in town), and a midlayer and rain jacket or hardshell. Always keep in mind that the weather in Patagonia is no joke and can change on a dime. Some routes are more difficult than others: the Huemul Circuit, for example, ascends rocky passes, involves a glacier crossing, and requires two Tyrolean traverses across raging rivers. For the hikes labeled “difficult” above, we recommend sturdy hiking boots, a pair of trekking poles, and a headlamp if the day becomes longer than planned. A GPS device is not necessary, although it never hurts to have maps downloaded on your phone via the Maps.me or Topo Maps apps. Additionally, trail maps can be purchased at various stores in town. There are a number of outdoor gear shops in the small town of El Chaltén, but don’t expect to find amazing selection or prices. We recommend buying your gear before you travel to Argentina and contributing to the local economy in other ways. But Chaltén's gear shops in town can be helpful for picking up small items in a pinch, and are well-stocked with propane and white gas (bencina) for your backpacking stove. Additionally, most gear shops in town have a large number of items for rent at reasonable rates, including equipment for the Huemul Circuit's Tyrolean traverse, boots, backpacking packs, sleeping bags, and more. A number of easy to moderate overnight hikes are possible by linking together some of the day hikes above. For example, it's possible to hike from El Pilar to Campo Poinconot for a night, onto Laguna Torre for a second night at Campo De Agostini, and then back to town on the third day. Camping is free and there is no need for permit. However, if you plan to hike the Huemul Circuit, you will need to register at the ranger station a short walk south of town. Registration is free and can be done in the days leading up to your trek or the morning of (the office opens at 9 a.m.). To qualify for a permit for the Huemul Circuit, you must present your passport, show that you have the required gear, and watch a short presentation on the route. When you arrive back in town following your trek, you must notify the park rangers that you have returned via a registration form drop box or email. 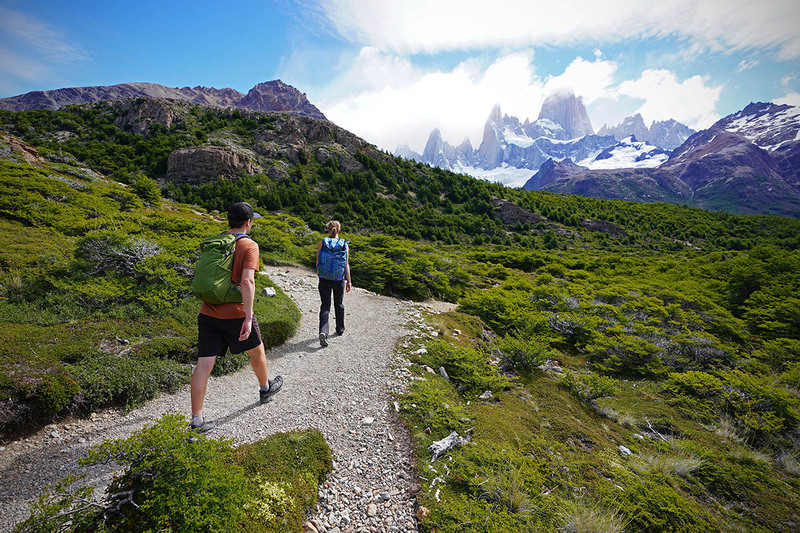 The town of El Chaltén is a hiker’s dream. It is quite possible—even recommended—to explore the entire area without a car. Most trekking routes begin just a few minutes’ walk from the center of town, and taxis and shuttles run frequently to the few trailheads outside town along Ruta 41. El Chaltén has plenty of accommodations to choose from, including hotels, apartments, hostels, and camping plots. For those who like to make plans in advance, Airbnb or Booking.com can be a good place to start. If you arrive without reservations, any of the numerous hostels or campgrounds likely will be able to accommodate you. 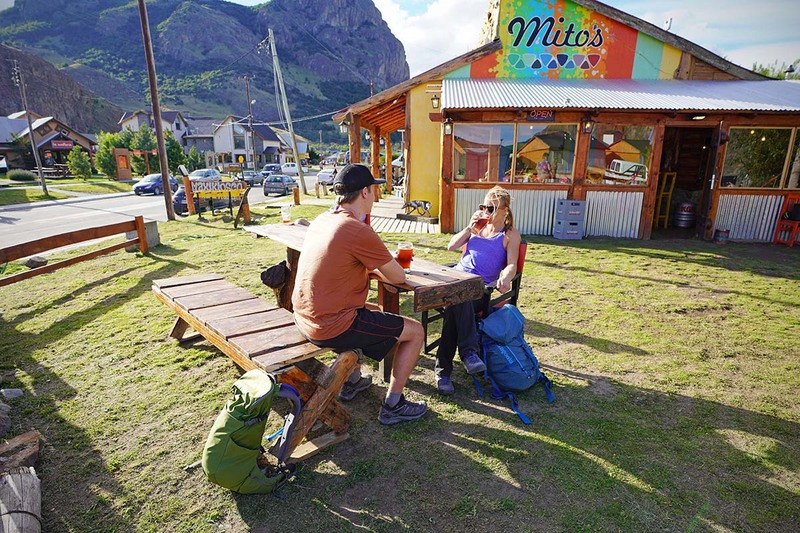 El Chaltén is well-equipped with grocery stores, panadarías (bakeries), restaurants, and watering holes to help you gear up for and wind down from long days on the trail.